Claudia Annie Carone introduces us to idyllic Salento, a charming, sun-kissed coastal region of Puglia steeped in culinary history. 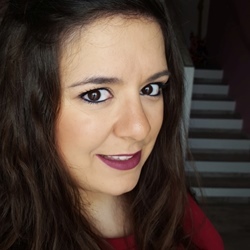 Claudia is an Italian journalist, food writer and photographer. Her life is divided between Emilia-Romagna, where she lives with her husband, and Puglia, her native land. Salento is a beautiful region in the southeast of Italy. 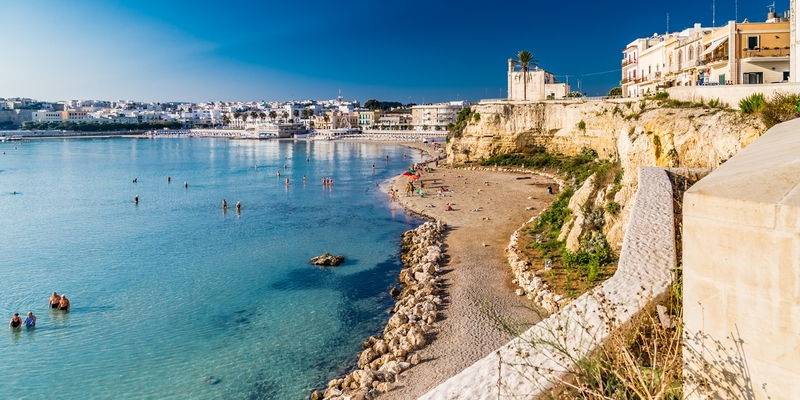 It is located in the lower part of Puglia, with the Ionian Sea to the west and the Adriatic Sea to the east, forming the ‘heel’ of the Italian ‘boot’. The area includes the provinces of Lecce, Brindisi and a part of Taranto. As a rule, the traditional cuisine of Salento is based around ‘poor’ and cheap ingredients such as barley flour, which is less expensive than refined wheat. Wild and cultivated vegetables and fish are also common, as traditionally meat was too expensive and oily fish were seen as less desirable in the north. Salento’s cuisine is characterized more than anything else by seasonal vegetables. Turnip greens, various types of cabbages and cauliflowers, chard, thistles, tomatoes, peppers, aubergines, olives, artichokes and spring onions crop up throughout the year, while beans are enjoyed fresh in the spring and dried during the winter season. 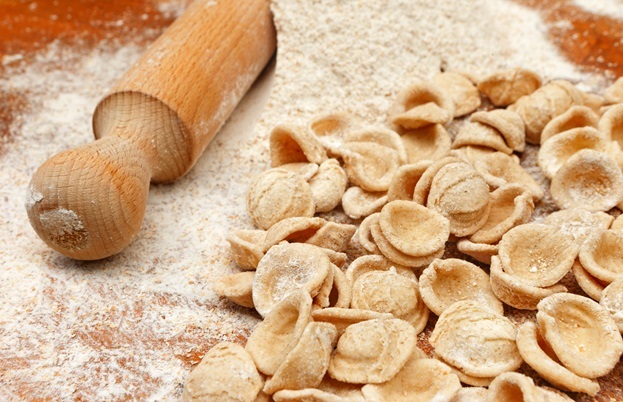 Vegetables tend to be consumed with bread or homemade pasta in dishes such as orecchiette with turnip greens, ciciri e tria (chickpeas with fried pasta) and a broad bean purée which is flavoured with olive oil and served with boiled chicory: a sublime combination of vegetables and legumes. Vegetables are also cooked in oil to preserve them. Aubergines, artichokes and peppers are often jarred in extra virgin olive oil and seasoned with vinegar, mint or salt, before being served as antipasti or as a sandwich filling. There are also the wild vegetables Salento is famous for – wild chicory, dandelion, wild asparagus, wild mustard and the famous wild onions called pampasciuni. Near the coast you can find marine fennel, which grows on wet rocks near the sea. The Salento landscape is teeming with vineyards and olive trees, mostly devoted to red and white wine (Negroamaro and Malvasia varieties) and extra virgin olive oil, which is famous all over the world. 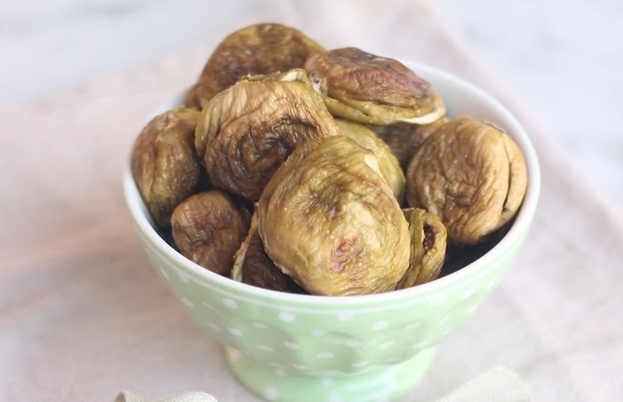 The most common fruits in Salento are prickly pears and figs (which are dried and stuffed with almonds to preserve them) in summer and citrus fruits in the winter. But you can also find several varieties of small pear, peaches, apricots, loquats, plums, cherries, quinces, pomegranates, watermelons and melons. There also wild fruits such as strawberries, jujubes, mulberries and carob. Most people in Salento traditionally ate legumes instead of meat except on Sundays, when a tiny amount was bulked out with a lot of bread to make meatballs. Meat from the horse, cow and pig were the most widely available, as they were used in the fields and would only be eaten when they became too old to work (this has changed in modern times, but the dishes and customs continue to live on). Turcinieddi is one of Salento’s most famous dishes – horse meat cooked in tomato sauce rolled inside lamb intestines. Salento’s cheeses are all made from sheep’s milk. Cacioricotta is produced in summer and can either be eaten fresh or aged for a few months for a stronger flavour. In winter Pecorino and ricotta are more common; a famous typical cheese is ricotta forte, a strong and spicy creamy cheese obtained from the fermentation of ricotta which is perfect when added to tomato sauce or spread on bruschetta. Bread and pasta in Salento are made with unrefined wheat flour which has a characteristic dark colour due to the presence of bran. Natural yeast (called mamma or criscitu) is used to leaven bread or pizza dough and cooking is done in a stone oven, using bundles of olive branches that give a special aroma to the bread. Bakeries often cook Friselle, a crunchy dry bread made with wheat or barley. Traditionally they were made for peasants and fishermen because they were so dry they could be stored for many months. 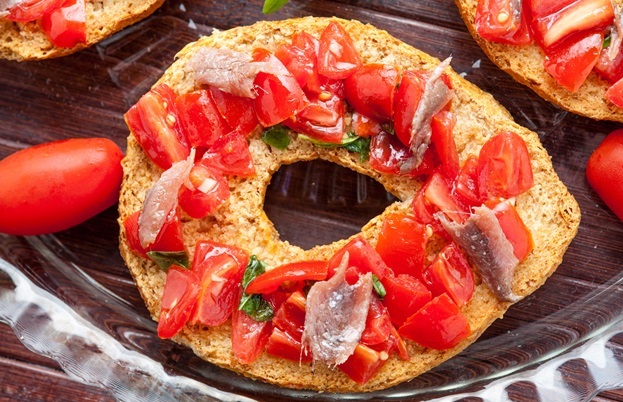 Fishermen in particular softened Friselle with seawater and ate them with a piece of cheese or ripe tomatoes. Today, Friselle are soaked in water for a few seconds then stuffed with tomatoes, salt, olive oil and marinated anchovies. Desserts reflect the influence of the Byzantine Empire and the Arabic world on Salento. The presence of almonds, honey and cinnamon is typical of the region, and almost all the sweet local delicacies include one (or all) of these ingredients. 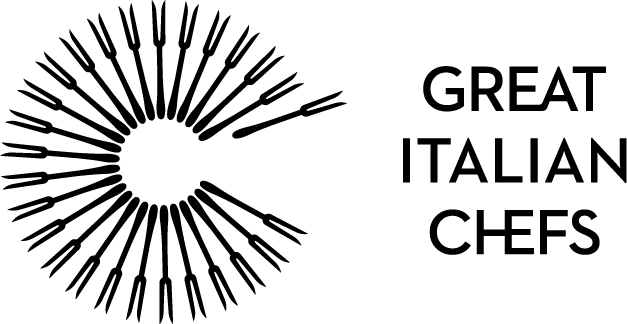 Lecce is home to all sorts of regional specialities. 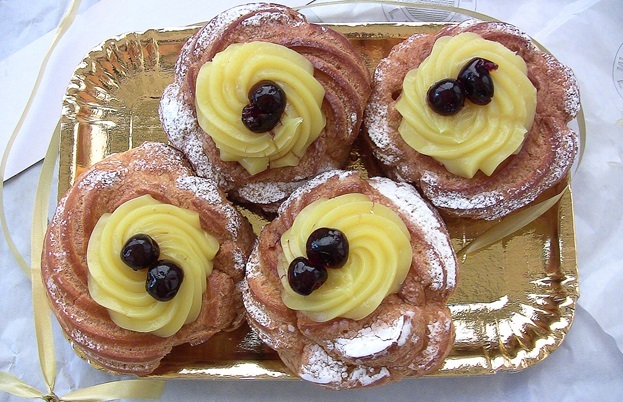 You can find pasticciotti – shortcrust cookies filled with set custard; pastry ribbons called carteddate which are twisted into circles and covered with honey or mulled wine and coloured sugar; zeppole (or St Joseph’s Day cake), a fried pastry topped with custard and black cherries and fichi mandorlati – dried figs stuffed with toasted almonds. Meanwhile in Luna there is a famous street cookie called cupeta, a crunchy, tough biscuit covered in caramelised almonds. The exquisite food of Puglia’s Salento perfectly represents the essence of the Mediterranean – sun, sea, rich soil and multiple cultures blend the intense flavours and aromas of this region's unique products. The food should be eaten slowly, sitting with family and friends, with plenty of local wine – something that’s just as dear to the locals’ hearts as their cuisine.